found something interesting this weekend to analyse. It is silver compared to gold. If we check XAG/USD with XAU/USD this past week, we see something completely different from the PA perspective. While silver as moving up strongly, gold was losing value. We have discussed already the different roles of the two, but usually they move to the same direction, only the strength of the movement is different. This different movement really got my attention. From a COT view, they are both still on a COT index extrem, but gold is moving to an even more extreme net position while silver is about to reach the net position extreme reading. Yes, interesting, maybe if we bring in copper then it becomes even more so. I have seen many analysts suggesting that Gold has ‘topped’ yet Silver, as a precious metal, is suggesting otherwise. Copper appears to have ‘topped’, as an industrial metal, like silver, it reached a high on March 18, then Mar 23 they both fell, then came the divergence. Silver seems to be out on the limb, def worthy of more research, will do some digging, thks for the heads up. We’re seeing levels right now on the Gold/Silver ratio that haven’t been tested since before the crisis. I’ve been long XAU all year- bullion, not miners - but the miners ($GDX) have really stole the show and I feel that what’s been happening is the installation of a solid base for the next big bull market (leg up continuation) for precious metals. I have been looking long enough to find the ebook of Williams “Trade Stocks and Commodities with the Insiders: Secrets of the COT Report”. If anyone has a soft copy may you kindly share with me. Yep, GDX reflects investor’s outlook on gold, always good to include a comparison, kind of gives a second opinion so to speak. GLDX is likely the best for this, interesting to see the volume on the eod charts on both since Dec 2015, almost gives a sense of excitement. Transferred over to FX and I’m thinking about USD, comparisons that we have encountered on Gold vs Usd on this thread courtesy of John Murphy, then taken a step further and I’m thinking about Eur, then taking that even further and I’m seeing the comments regarding Eur levels from sources within the ECB. I have added Gold and Silver to my database but I couldn’t add oil or equities due to having a micro account and needing a mini account level. I have now moved straight on to currency crosses, the data for EUR/JPY has been added but I will do the charts and back-test next week. That will be a great info PP as EUR/NZD did not work out well earlier. 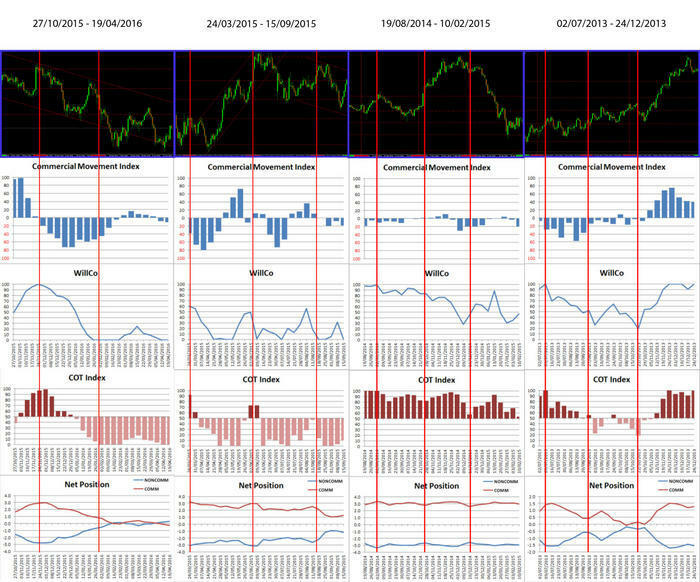 Maybe you can post a chart with the COT signals so we can see how accurate/inaccurate those signals were. Will do. Like I say I am using 4 charts (for now). They are Net Position, Cot Index, Cot Movement Index and WillCo. I didn’t do the CP/OI, but I do not use this anyway, at least not for now, and I am happy analyzing the data for OI. The data for Commercial Net/OI looks as good as any other. I ran 4 tests , 2 with an average and 2 combined, 2 my way and 2 Brieses way, although nothing to do with OI, the totals were the same, so at least I am on the right track with the other stuff Unfortunately working until Saturday night so will do it on Sunday! <EDIT>The tests were for OI and the general calculations for the other stuff, but I was mainly concerned with getting the Briese stuff correct. The average and combined totals are OI testing. Here are the charts for EUR/JPY. The OI test where I used average and combined calculations, well the charts were exactly the same, not surprising really. 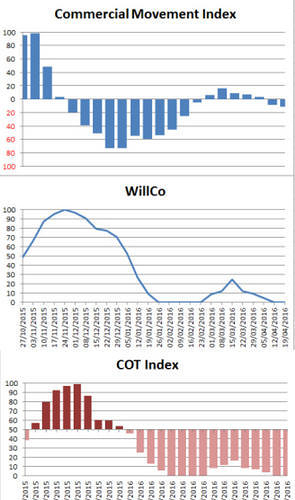 The only difference is that the averaged totals for the Commercial Net Position/OI seemed higher than the other instruments, but the WillCo data matched both the averaged and combined data exactly the same. I have a couple of questions though. 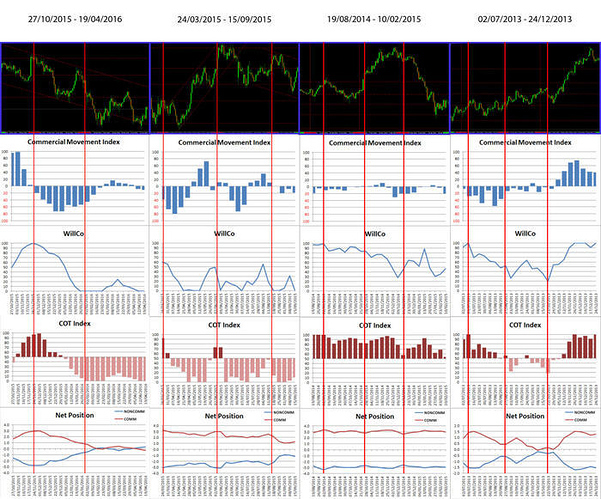 Did you put your findings on live charts to see how valid those signals are? If yes, did you try other crosses as well? Those backtests will show if the idea worked out or not. You made a nice work, but we have to look it from a perspective which shows if it can be used or not. I took the time to analyse silver and gold from a price perspective and COT perspective too, and compared it to copper, the instrument you mentioned last week. Well, interesting is that copper is confirming neither gold nor silver based on the COT report readings. My expectation was that it will show some similarity to at least one of the two assets with the extreme readings. Well, it did not. I did find however something very interesting. Crude oil does show similar price movement and also similar COT readings lately with silver. Do you think that it is a coincidence or is their some logical explanation for that? I am mainly just trying to get the database up and running at the moment because I only have 10 instruments running now. I will do a more thorough test tomorrow with EUR/JPY since there is no point moving forward if it doesn’t hold true. I looked at the high net position early on in the chart (everything was synced) and this would have produced roughly a pessimistic 500 pip profit with a potential optimistic profit to around a 1000 pip profit. It is still running, but I do not know where to! Maybe it is correction coming, maybe it is not! My weekend is now, but next weekend working unfortunately. I have back-tested 2 years of data, should have been 2 and a half years but I missed 6 months along the way but I think it was a non-event anyway, similar to the third chart from the left. Anyway the charts are not as conclusive as I thought with the COT Movement Index NOT moving and other charts not reaching their signal points. I have marked off some points of interest but there is not enough confirmation to enter the trade in my opinion unless I alter the signal trigger. <EDIT> Actually just seen a good signal, 19/11/2013 on the right side chart. PP, this is a very nice work and usually we learn from these. When I made a EUR/NZD analysis, it looked similar to your findings. Some better signals, some weak signals, but the original USD pairs in the COT were just more accurate. However these conclusions can only be made with such analysis that you just posted. PP, this is a very nice work and usually we learn from these. When I made a EUR/NZD analysis, it looked similar to your findings. Some better signals, some worth, but the original USD pairs in the COT were just more accurate. However these conclusions can only be made with such analysis that you just posted. I have just added the EUR/CHF to my cross currency list and there is are some ok signals. Please excuse the trading chart as this is not totally accurate because I am missing the end of the period but I wanted to show the entry point I would have taken with the regarding date signals. Seems chalk and cheese to the EUR/JPY but I have not fully back-tested and will not be doing that for a while. we got answer for the question we had some weeks ago: is gold going to follow silver or vice versa? Well, Gold followed silver and also it followed crude oil. 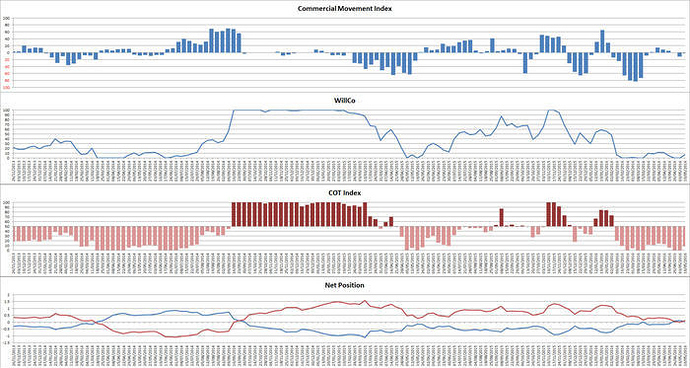 Looking at the COT Index phenomena (not only the value) it looks like we might have bottomed out. Well, I am not there to catch those bottoms (anyway we moved already quite a lot away from the bottom), but the extended time period at the extreme value could be a sign. From a fundamental perspective, not all GDP and Inflation readings are negative at the moment which could confirm this theory. How do you see it? PS: I am having quite large problems with logging into the BP site, scrolling down on pages etc. The site is almost impossible to use. I am not sure if anyone else is facing similar issues. Still cannot scroll most pages, only can access using history so will wait until later. Did me showing up kill this place? Haha. It used to be much more active, no? I am now doing a full back-test and will start making it after the data tonight. I am going to use PhotoShop to analyze my data since I can zoom in and out of it and print images when necessary. This is an example 2-and-a-half Year chart stack, minus the platform chart, of GBPAUD.